Earlier this week I came across Jacob Morgan’s suggestion to do one thing every year you’ve never done before. He recommends this as a way to keep growing and learning. I frequently take on more than I have capacity for. The appeal of Morgan’s suggestion is that it improves focus and likelihood of getting really good at something. The downside is potentially forgoing other activities that are interesting and valuable. However, Morgan doesn’t say not to do other things. My interpretation is to make one thing a key focus and put more effort into mastering it. Without consciously applying this concept, in 2018 my one new thing was the Learning Uncut podcast. I also did other things I hadn’t done before. This included running a public workshop series and managing a highly collaborative global project virtually. Each of these activities required development of new skills. Each exposed me to significant learning opportunities. However, the podcast stands out as it required the most sustained effort, and is I will continue to do it as a foundational element of my work. Business Impact – Will it have a positive impact on my business success (sales, cash flow, profit)? Contribution – Will it help others? Over what time-scale? Learning – Will it stretch me and help me to learn new, useful skills? My initial numerical evaluation failed to discriminate adequately between the options. However, it did provide one critical insight. I initially rated all options low against Joy. To sanity check this I picked three activities that had brought me joy in 2018. The common thread across these activities was collaboration and connection with others. These were all activities I had undertaken with at least one other person and which allowed me to interact directly with many others. This is something I have come to appreciate about myself in 2018 – collaboration is a critical ingredient of my best, most enjoyable work. It also accelerates my learning. So, whichever option I choose I should find a way to collaborate and connect as I do it. I was still unsure which option to choose, so wrote a brief qualitative evaluation of each. I ran three webinars in late 2018, all with another person. They are a good way to share knowledge and ideas. Done well, they encourage action and support change. They are versatile e.g. could be used for building capability, generating change and marketing. I enjoy developing and delivering them. They are a good way to connect with others and create an ongoing conversation. I could so some in partnership with others, and some solo. The technology and cost to get started is low and I could rapidly build upon my existing skills to deliver great webinars. On the con side, a lot of webinars are delivered for free so it could be difficult to monetise them. But not impossible. This style of blog writing is about generating change in an area that matters to you. The intent is to highlight what isn’t working now and share a vision for a different future. My quest is to transform approaches to learning in organisations. I’ve been blogging in this way under the guidance of a mentor, Katie McMurray, for two years. This is different to my daily dispatches (one of which you are reading right now). The purpose of a daily dispatch is to show a piece of your work for the purpose of learning and improvement in work practices (your own and others). I find dangerous blogs much more challenging to write. The stakes are higher and the effort to gather my thoughts and convey them more demanding. I use a mentor for motivation, accountability and improving technique. Katie Mac is also a source of good ideas and advice on other profile / publicity activities. She provides a different perspective on my relevance and potential contribution. I sometimes want to give up Dangerous Blogging. I find it a lonely, occasionally frustrating activity. I persist as I see tremendous value and potential to create change if I do this well and consistently. It’s a longer-term play. Belonging to Katie Mac’s Dangerous Blogging community connects me with a supportive group of fellow bloggers – we encourage and learn from each other. Participating actively in this group is an important support mechanism, and takes the edge off the loneliness. I could lean in more. I’ve developed online courses as part of a team inside an organisation and updated a largely curated course for a client. However, I’ve not created any online courses in my own business. Creating an online course requires a wide range of skills – all of which I could build or source through others. Technology selection would require research and/or assistance. I may require technical support with the build and/or hosting. The commercial risk is higher on a course than a webinar. Research and a lean development approach would help address this. I could use webinars as part of my research and development. I reviewed numerical ratings after completing a written summary. Written reflection helped to clarify my thoughts and refine my ratings. I’m refreshing resources in preparation to run mentoring sessions to help people develop a Professional Development Plan. I want to give people a different perspective on what it means to take charge of your own development. To unleash greater creativity and boldness. To help transform approaches to professional development. To help people stretch and build future-ready learning skills and habits. I checked on Jacob Morgan’s YouTube channel where he posts about the future of work. Some of his videos are aimed at employers and leaders, other at individuals. I was looking for content talks about why continuous learning is an essential skill and habit for individuals. I discovered one I hadn’t seen previously which excited me. It’s something I think I would benefit from applying. My reaction is an indicator that it’s worth sharing with others. It contains one key idea. Morgan’s ‘One Rule to Keep Growing and Learning’ is to do one thing every year you haven’t done before – and to do it really well. He’s talking about something big that you embed as a foundational element in the way your work and think (I would add ‘learn’ to this list of verbs). While Morgan talks about this in the context of building his personal brand (which can be inside an organisation or outside), it is completely relevant to your professional development and future-proofing your career. Looking back on 2018 the one big thing I did was to launch Learning Uncut podcast with my colleagues Karen Moloney and Amanda Ashby. Of course, it wasn’t the only thing I did that I hadn’t done before, just the one that was the biggest stretch and took the most effort. It will also continue so is now a foundational element of my work. I have several options to decide between for my one new thing for 2019. “Do I really need to limit myself to one?” If I want to do it really well … the answer if probably yes. Morgan’s point is about becoming great at one new thing. It’s about focus. I’ve been hesitating to name my one thing as there is an opportunity cost. Putting effort and resources into one thing means less investment in other things. After leaving this penultimate paragraph unwritten for several hours I realise that I’m not quite ready to pick my one thing. I have short list of options. All are things I have done before. However I’ve not done any as well as I would like. None of these skills or practices have reached the standard I aspire too. I’m going to vary Morgan’s advice. Rather than doing one new thing, I’m going to pick one thing I’m already doing. Then I’m going to do it regularly, frequently – and become really good at it. I’m not yet sure which to pick. I’ll create evaluation criteria and rate each option. I’ll also speak with some trusted advisors before finalising my selection. Watch Morgan’s video below and let me know what you think of his advice. Will you be doing one thing in 2019 that you haven’t done before? What is it and why did you select it? 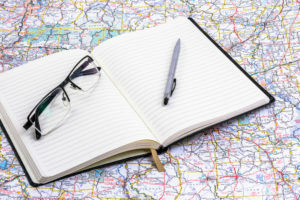 Keeping a journal is a common approach to both building self-awareness and learning from specific events or activities. Journalling can be a regular habit (e.g. daily or weekly), or done when specific triggers occur. Either way, keeping a journal is one of the most useful personal development and learning habits you can develop. A keystone habit helps lock other habits into place. 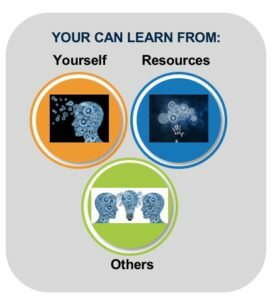 As such I recommend regular reflection via a journal as a high leverage learning habit, and an excellent starting point for anyone wanting to be more effective with their personal learning. More specifically, if your intent is to learn, keeping a journal is a form of sense-making; it helps you to make sense of and experience or even, see patterns and connections over time, and improve how you learn. You can either write on a regular schedule (e.g. daily or weekly), or when a specific event occurs (e.g a project milestone, after a recurring meeting). Research on habit formation indicates that you are more likely to develop a habit if you identify a cue or trigger for doing the action you want to take. For example, when you sit at your desk after your afternoon coffee, after your morning walk, after your weekly team meeting. For many people scheduling an appointment in their calendar / diary helps to protect a block of time to write. The time required to write in journal regularly does not need to be large. You could invest as little as ten minutes a day to gain significant benefits over time. 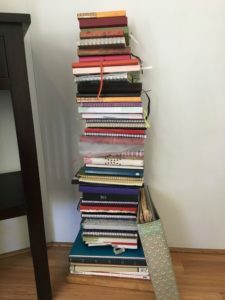 What does a learning journal look like? Experiment with formats. Combine different formats to figure out what you enjoy and find effective. Journal entries can be made either by hand-writing or typing. Each has their pros and cons – try both and see what you prefer. My Year 8 English teacher introduced me to journaling, and I’ve maintained this practice on and off for close to four decades. When I commenced journaling hand-writing was the only option. I enjoyed the tactile sensation of writing on paper, the look of my journals lined up on a bookshelf, and the ease of flicking through the pages. However, I was always concerned with privacy as it is easy for someone else to look through a physical notebook, and this led to some self-censoring. I’ve recently gone fully digital, including scanning a one-metre high stack of old paper journals (as shown in the photo). I use Evernote for my journal as it synchronises across all my devices and has very good search capability. I’m interested to explore how my thinking on different topics has developed over time by searching for entries by word, phrase or tag. For ideas about how you can learn, tools and links to further resources choose from the list below. Select a hyperlinked item for further information. You can use this post as a master list to access posts on each item. 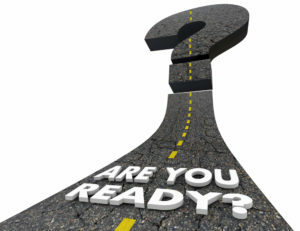 Note – I am writing these posts as a follow-on action from a keynote presentation on Future Ready Learning at a professional development conference in February 2018. I will gradually add linked posts on all items in coming weeks. Consider this a ‘work in progress’ which I am sharing as it is developed so that people can start using it immediately and provide me with feedback and suggested improvements. If you have any comments or suggestions please message me via Twitter, LinkedIn or email (Michelle@michelleockers.com). 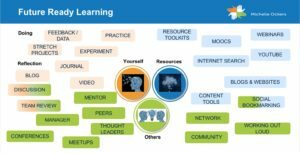 The image below shows some of the ways of learning that I will add to this master list. Learning from yourself consists of both doing and reflecting. They are complimentary, iterative actions. Reflection is a powerful way to learn from our own experience. It is a process of thinking about a past event and thinking about what happened and what you can learn from it. We can reflect either with others or on our own. We also have the option of keeping individual reflection private or sharing it with others. 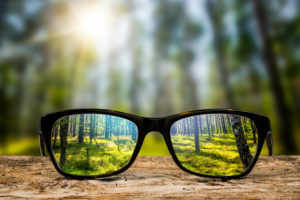 While you can reflect in your head, it can be very helpful to make a record both to improve the quality of your thinking and to have a record that can reviewed at a later time to gain further insight as you look for patterns and further learning. Resources for learning come in a wide range of forms. This list predominantly covers online resources. It will also cover books (which can be consumed electronically or in hard copy). One of the great things about the internet is that it’s given us access to an incredible amount of resources and content. This is also one of the really challenging things about the internet. To get the most out of online resources requires that you can find good quality content relevant to your needs. Fortunately there are tools available to help with this and skills that you can develop to critically evaluate sources. You will also find your online network will assist you with this both directly and indirectly through their use of common tools that enable resources to be readily shared between people with common interests. This is a summary of key themes of the keynote presentation I delivered at the 2018 Administrative Professionals Conference at University of Wollongong. The overall theme of the conference was ‘Be Future Ready.’ This summary will be used in an internal publication reporting on the conference. Ongoing change is normal in today’s workplace, with much of it being driven by advances in technology. We have entered the 4th Industrial Revolution where computers and robotics are replacing or supplementing work done by human brains. Digital technology has already changed the way many products and services are purchased and delivered, and has radically altered industries including banking, travel, music and movies. All occupations will be impacted by automation and people will increasingly interact with digital assistants and other forms of Artificial Intelligence to get their work done. Besides being able to work effectively with technology, social skills which are difficult for computers and robots to replicate are becoming increasingly important – such as empathy, compassion, listening, influencing and leading people. To keep our skills relevant and be future ready in an environment of ongoing change and increasing competition for work roles it is imperative that we take charge of our own learning. This requires us to shift our mindset to learning continuously as we work rather than expecting training courses to be adequate to maintain our skills. Michelle explored ways of doing this by learning from yourself, from resources and others. Michelle invited participants to recap key content from her session and access further information on learning strategies, resources and tools in the ‘Michelle Works Out Loud’ page on her website. Everyone is welcome to follow these posts and join the conversation using #futurereadylearning on LinkedIn or Twitter.